Go to any indie festival and it's not long before somebody starts talking about money. At the Visual Communications Film Fest 2000's Annual Los Angeles Asian Pacific Film and Video Festival, held May 18-25 in Los Angeles, the issue of money—in this case, corporate sponsorship of the festival—took center stage in record time. Before the screening of the opening night feature, organizers ran a "thank you" spot listing the festival's sponsors, leading off with the most generous "platinum" donors, two Asian American dot-com start-ups that had donated $15,000 to the cause. But as the listing worked its way down to gold (Universal Pictures, The Los Angeles Times) and then to silver, the size of the credits shrank substantially, amidst hoots of laughter from the audience. By the time the three bronze sponsors were announced, the citation was a barely readable, postage stamp-sized block in the screen's bottom left corner. "Spend more," yelled one attendee. Four years after Visual Communications dissolved its 12-year partnership with the UCLA Film and Television Archive, festival organizers continue to wish that more sponsors would heed that lone audience member's advice. "We're a community-based organization, not an institution, so we don't get a ton of foundation money," says organizer Abe Ferrer, who has been with the festival for 14 years. But Ferrer sees a partnership with large institutions like UCLA as a mixed blessing. "When you're working with an organization that has certain resources, you tend to stop growing and learning," he says. The split with UCLA offered festival organizers a chance to take a few more programming risks, particularly with their selection of documentary films. 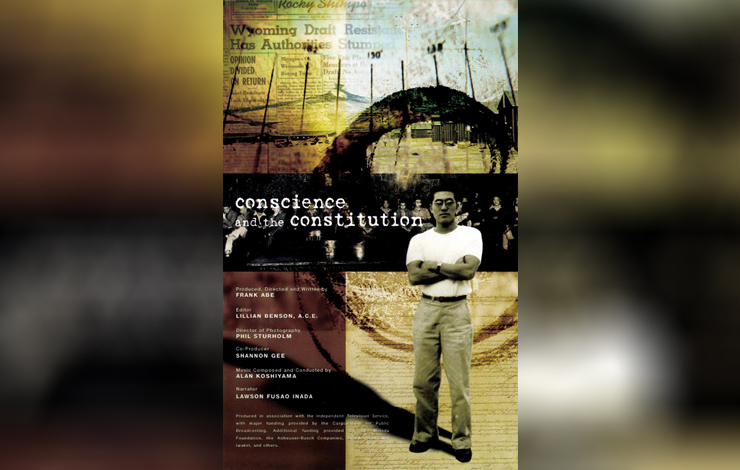 Conscience and the Constitution, a film about Japanese American draft resisters during World War II, reflects that change in attitude. Director Frank Abe rejected the traditional internment camp film narrative—with the US government as sole villains, and the Japanese Americans as victims/sheep—in favor of a critical look at the actions of the Japanese American community itself. His film particularly blasts members of the Japanese American Citizens League, the community's leading civil rights organization, for its mistreatment and decades-long ostracism of the "resisters of conscience" who refused to be drafted out of the camps. Considering the Japanese American community's historical tendency to fund more positive, "uplift the race" types of projects, Abe's documentary, seven years in the making, took a great deal of courage both to create and present. The powerful film generated a lot of favorable fan buzz and media attention probably helped along by the appearance of several of the draft resisters who appeared in the film at a post-screening reception—and went on to win the festival's audience award for best feature film. An appearance by one-man-band Arthur Nakane also helped sell first time director Mike Sakamoto's "Secret Asian Man," a 17-minute black-and white documentary about the LA-based musician/cult figure. While the rockumentary has not always been the most respected of film genres, the recent spate of tabloid cable TV music docs has made it even tougher to create a musician-based biopic that doesn't border on self-parody. With a subject like Nakane, a 60-something Japanese guy who dresses in black leather jump suits and performs Elvis tunes on a makeshift pile of cobbled-together musical instruments, the mission became even more challenging. But Sakamoto manages a very sympathetic portrait of Nakane, largely because of the earnestness and sincerity of his profile subject. The director refuses to go for the cheap shot or the easy laugh, and for the most part eschews audience reaction shots and the obligatory testimonials from friends and colleagues in favor of letting his subject tell his own story. The gamble paid off: after years of "creative financing" (the director installed dry wall and carpet at a local post production company office in exchange for free Avid hours), Sakamoto premiered his film at Sundance 2000 to enthusiastic reviews. Creative financing took on new meaning with the production of There's A Strong Wind in Beijing, a guerilla filmmaking exercise out ofthe People's Republic of China. The creators shot the film using 13 reels of expired 16 mm Kodak Eastman film (seven of which were over eight years old) and conducted interviews using a lavalier microphone taped onto what appears to be a long broom handle. They proudly cited their film's one-to-one shooting ratio in the closing credits: 'All of the footage shot has been used in the final product." The big bucks they didn't spend, as the saying goes, is all up there on the screen. The project concept was even simpler than the filmmakers' equipment: follow strangers around the streets of Beijing and ask them the deceptively simple question, "Do you think Beijing's wind is strong?" According to the filmmakers, the seemingly innocuous question was a way to reveal Chinese culture and attitudes "in a society where one always thinks twice before speaking, especially in front of a camera." While the question seems tame enough, the filmmakers were not, following strangers into public restrooms and barging into grade school classes. The film's most intriguing moments come when the camera crew accosts the groom at his wedding reception, and interviews a grieving woman whose eight-year-old son has just been diagnosed with terminal cancer. The closing night feature, director Deann Borshay's first Person Plural, was another one of the festival's standouts. Born in Korea, the filmmaker was adopted out of a Korean orphanage by a white couple in Fremont, California. Renamed Deann Borshay, she lives a fairly typical suburban existence until she begins having haunting dreams of a past life. Borshay finally discovers that she had been substituted for another young girl that was slated for adoption, and that her Korean mother and brothers and sisters are still very much alive. Ruby Yang explores similar themes ol displacement and cultural identity in Citizen Hong Kong, a compelling look at the lives of five young people: Qui Ke Jia, a high school girl who immigrates to Hong Kong from China and must explain to her mother why she is failing her Chinese class; Ed Wu, a 30-something Star Wars addict who dreams of going to art school while working in a dead-end job; Edward and Edwin Chan, two members of the Hong Kong Theatre of the Deaf; and Louise Wong, an English-language radio announcer raised in Australia. This witty, smart documentary, with its thematic parallels to many films about the Asian American experience, presents a strong argument for continuing the festival's commitment to international works. Ferrer, in fact, doesn't foresee the festival going strictly Asian American any time soon. 'As Asian countries become increasingly Westernized, they're experiencing the same kinds of angst that a lot of Asian American folks are going though," he says "These films coming out of Hong Kong and Singapore and the Philippines demonstrate how we can all be displaced, regardless of where we call horne." Another festival standout was The #7 Train: An Immigrant Journey, a gritty day-in-the-life doc that follows four riders on a New York route nicknamed "The Orient Express" (as one observer explains, the train earned its name because "there are too many Orientals on it"). At times achingly funny, the film's depiction of four of its passengers—a gay Pakistani sari shop clerk, a Korean fishmonger in Harlem and two Ecuadorian street vendors—is both sensitive and revealing. Janice Tanaka's When You're Smiling: The Deadly Legacy of Internment was another must-seen an insightful examination of the lives of Japanese Americans in the decades following World War II. The film opens with a bang—the deaths of 31 young people from "mysteriously similar causes"—and then proceeds to examine how the internment experience continues to impact successive generations of Japanese Americans. As usual, many of the festival's strongest entries were in the documentary field—perhaps not so surprising given the history of Asian American cinema, with its roots in the social movements of the 1960s and 1970s. Most of the leading pioneers of Asian American film got their start in documentaries, and the genre continues to attract some of the community's top filmmaking talent. The only rap on this LA-based festival, it seems, was the usual complaint about the city: it's just too spread out, geographically speaking. With some screening venues separated by an hour drive in freeway traffic, it's tough to get the sense of community and cohesiveness that a festival like this attempts to foster. Not that they didn't try, with everything from events like the opening night's festive, star-studded Filipino bash to the plethora of dot-com booths promising the dream of pan-Asian virtual community (divided up into the appropriate ethnic categories, of course). But despite the challenges of budget and geography, VC continues to host one of the country's top showcases for works by Asian Pacific filmmakers, and one of the US' most consistently doc-friendly festivals. Robert Ito is a freelance writer and Associate Editor at Los Angeles Magazine.